Join Devri for our 8th Annual Hawaiian-themed Irish Music Cruise of beautiful Boston Harbor! Ticket includes four hours at sea with the best Irish music in Boston featuring Devri and many special guests along with a free one-day pass to the South Shore Irish Festival (Sept 22/23) and a free sample of Flaming Leprechaun’s Triple Distilled Rum. Cash bar on-board. Boarding will begin at 2:30 pm, and the boat leaves promptly at 3:00 pm. Don’t be late! We’re hoping for sun and are ready to rock the Harbor with a boat full of coconuts, shamrocks and grass skirts!! Dress in your best (or worst) Hawaiian gear for this party on the harbor, and help raise some funds for a great cause! All followed up by a mighty afterparty at Mr. Dooley’s, of course! Net proceeds from the Cruise benefit Lucy’s Love Bus™, whose mission is to improve quality of life for children with cancer and life-threatening illness, to support their families, and to mobilize the next generation of cancer activists. More info on this great organization can be found at lucyslovebus.org. 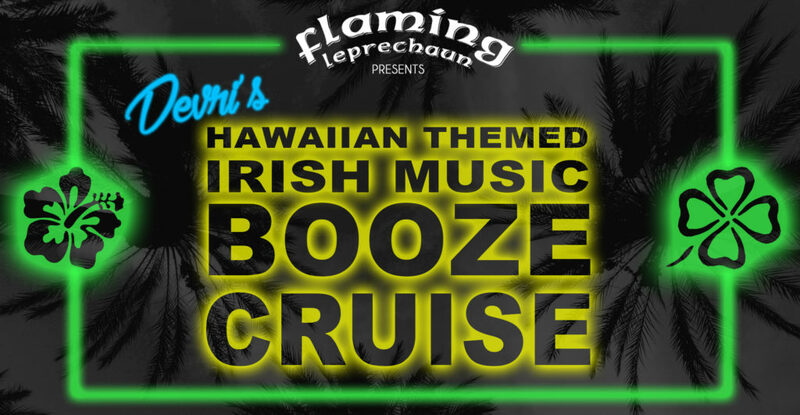 This event is brought to you by Flaming Leprechaun as they officially launch their new rum in Boston aboard the ship. Be sure to try Brendan’s Triple Distilled Rum — Smooth as Honey, Fiery as a Leprechaun! Get your tickets now, this event WILL sell out. This is a 21+ event, all passengers will be required to present positive identification prior to boarding. No refunds given for ticket holders not meeting this age requirement.